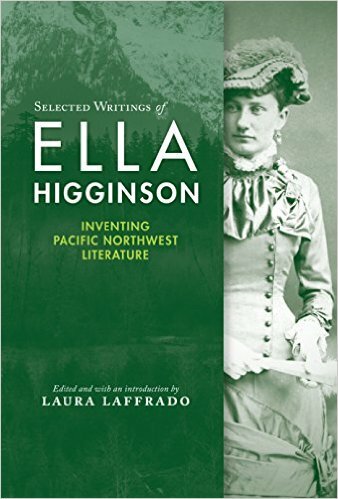 The first prominent literary author from the Pacific Northwest, Ella Rhoads Higginson (1862?-1940) has been largely forgotten as a key American writer. During the turn from the nineteenth century into the twentieth century, readers across the nation were introduced to the remote Pacific Northwest region by Higginson’s descriptions of majestic mountains, vast forests, and scenic waters, as well as the often difficult economic circumstances of those dwelling near Puget Sound. Higginson was celebrated for her award-winning fiction, her lyric poetry which was set to music and performed internationally, and her distinguished position as the first Poet Laureate of Washington State. Throughout her literary career, Higginson published hundreds of poems, stories, and essays in leading magazines and newspapers, while also writing books, including the novel Mariella, of Out-West (1902) and the nonfiction work Alaska, the Great Country (1908). Higginson’s reputation as a well-known American author faded chiefly due to her singular position as a literary writer in the turn of the century Pacific Northwest, far from other regions and writers at the time. Areas of the United States such as New England and the South were often portrayed by many different authors in earlier American literature. Taken together, such writings created familiar literary regions for readers. However, only in Higginson’s writing did the Pacific Northwest of over a century ago spring to life in precise detail. Because of this, her work stands alone. Selected Writings of Ella Higginson seeks to restore Higginson’s prominence by reintroducing readers to her life and her most celebrated works. With a comprehensive introduction, explanatory notes, and other supplementary material, this collection reclaims Ella Higginson as a significant voice in American literature.